Upon this the beaver began to sing just like a human being and surprised the people very much. While it was doing this it seized a spear and threw it straight through its master’s chest, killing him instantly. Then it threw its tail down upon the ground and the earth on which that house stood dropped in…It is from this story that the Dê‘citân [Deisheetaan] claim the beaver and have the beaver hat. 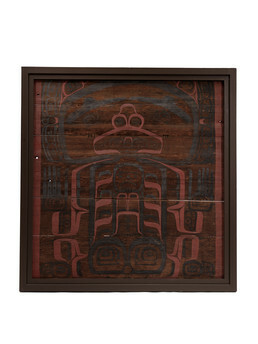 This carved and painted screen is from a Tlingit clan house and was once part of a wall that separated off a rear room reserved for the house leader and his immediate family. The red cedar panel may be two hundred years old or more. The central figure has been interpreted as Beaver because of its large incisors, and the design may refer to the Deisheetaan story, “The Beaver of Killisnoo.” However, Beaver crests are owned by several Raven and Eagle clans and the precise meaning of the art is unknown. The figure may even be a bear, or marmot.